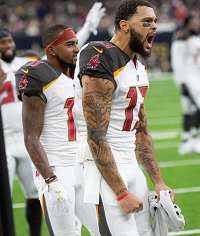 Joe chatted 1-on-1 with Mike Evans yesterday and learned he has a new goal. One reason Evans is beloved at One Buc Palace and was handed more than $16 million per year is because he’s fiercely dedicated to improving his game. As many fans know, Bucs wide receiver DeSean Jackson is renowned for his offseason workouts with his longtime track coach. Jackson trains like a professional sprinter, in many ways, in order to maintain and enhance his elite speed. While other guys are running routes and catching ball after ball in April or June, Jackson is refining what has kept him scaring the hell out of offensive coordinators for 11 NFL seasons: his wheels. This has made a huge impression on Evans. And on Evans’ 2019 bucket list is hitting the track to train like Jackson, Evans told Joe. Perhaps it won’t be exactly the same way, but Evans said he does want to work with a track coach to explore how much faster he can become. It’s worth noting that Joe didn’t bring up anything related to working on speed or on a track. This all came from Evans. Hopefully, Jackson can guide Evans to the right track coach/training regimen. Good way to keep those hamstrings strong!! speed is what got djax into the league…..your measurable and catch radius is what got you into the league…..
refine your technique and skill set…..work on being you not someone else…..stay in your lane mike…. @813bucboi I’m pretty sure your in the same group of ppl that complain about McCoy being too soft and he needs to play meaner. Double standards. If Mike thinks he can get fasterthen so be it. It will only improve the team to have 2 speedsters instead of just one. Just cause you came in the league with one contribution doesn’t mean you should be limited to solely that. Plus this is Evans we’re talking about…do we really expect less from the kid? I kind of agree with 813. Mike has to catch the football, not take the ball to the house. There’s already been two ugly drops this year where he was wide open and flat footed and simply dropped the ball. For Mike Evans game that simply can’t happen. At some point you have to realize that you’re the best possession receiver in the game and work hard to continue to be great at that. Stop worrying about YAC and breaking one to the house, we got guys for that. We need Mike Evans to catch every 15 yard in we throw his way regardless of coverage, just be unstoppable at that. Comparison can be the thief of joy. Evans doesn’t get enough national attention. I’d take this guy over Odell any day of the week. Get after it Mike! screw GMC….aint nobody talking about him!!! !…..mike didn’t get drafted to be a burner….he got drafted because he can out jump any CB, high point the ball and be a mismatch for CB’s because of his height…..his game was never about speed…..
that’s like djax saying he wants to bulk up so he can run defenders over…..his game will never be about strength and running defenders over….djax’s game will always be about speed and quickness…..
evans needs to realize he’s a Mercedes SL550 and djax is a Ferrari…..both luxury cars….everybody would love to have either one…..
For a big dude he has deceptive speed. Just ask Lattimore from NO. Savage Mike is top 3 in the league no question. This kind of training WILL help him exponentially. This dude is STILL kind of raw as an athlete and WR. Which is crazy considering his production, but ME will keep working on his craft and should have a very long career because of that. He’s already made huge strides in his rout running and stamina. If he can get a track coach to unlock that little bit of extra speed and off the line quickness.. watch out! 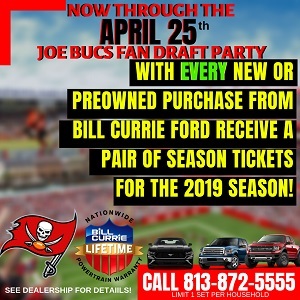 Agree with 813bucboi’s first comment. For what its worth, Mike is already pretty fast. JW is back. YAC will be a non issue. The Bucs really need to get Evans going. Little known fact: Tampa is 12-12 when Mike pulls in six receptions or more in his previous outing, as opposed to 9-30 when pulling in less. Yikes. Mike is already fast, but he’s trying to be a totally dominant WR in themold of Randy Moss/Calvin Johnson. Why does Mike wanting to work on his speed have to hinder his ability to catch? They’re not mutually exclusive as he’s trying to be a better WR. He didn’t say he wants to be DJax and be a burners and forget about his strength as a leaping possession WR. He wants to be a better WR and that means with all facets of the game. If he can add an additional couple of seconds to his game, that will help him create more separation with the DB and get more YAC. I’m all for Mike wanting to be the best WR he can be. The more ways he can beat you, the better. Sometimes it might be as a boxout baller and other times it might be breaking out of a cut faster than you can recover. Whatever it takes!